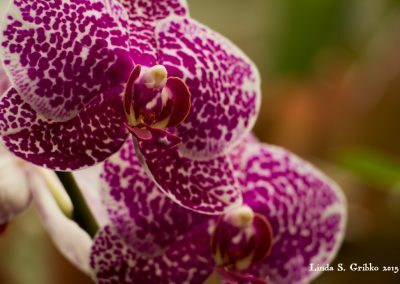 I’ve been a little bit of an orchid addict since 2009, when my mother gave me a beautiful pink moth orchid (Phalaenopsis spp.) for my new office. 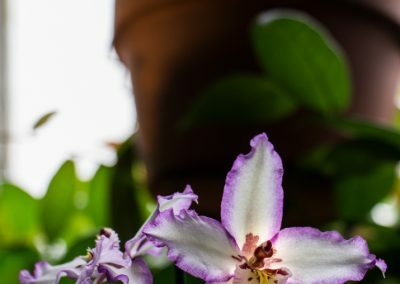 That gift started my personal collection, which sometimes blooms for me and sometimes doesn’t. 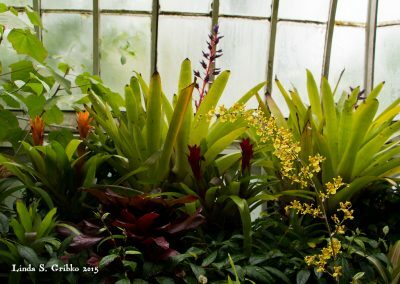 It also started my obsession with the Orchid Room at Phipps Conservatory and Botanical Gardens in Pittsburgh, Pennsylvania. 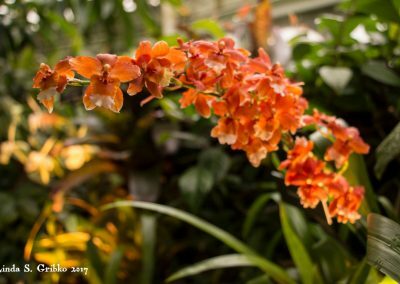 I’ve been traveling up to Phipps regularly with my camera to enjoy the orchids for several years now, and on a gray, rainy day in January 2017, finally decided to share some of my best photos. 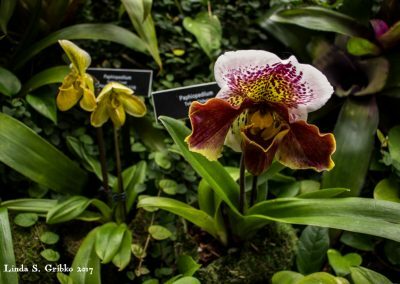 Here they are in all their colorful glory, including a selection depicting part of Phipps’ award-winning slipper orchid collection. 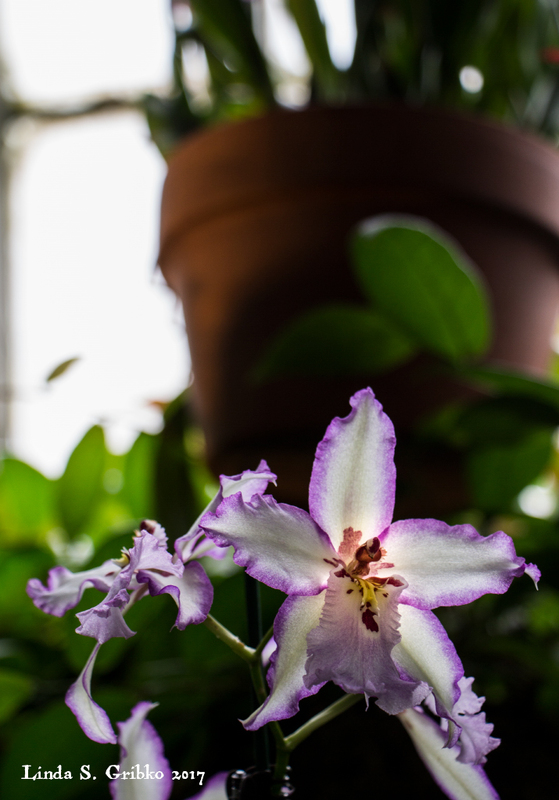 I’ve done my best to identify the genus of each plant, but took no notes while shooting and may have some names wrong. 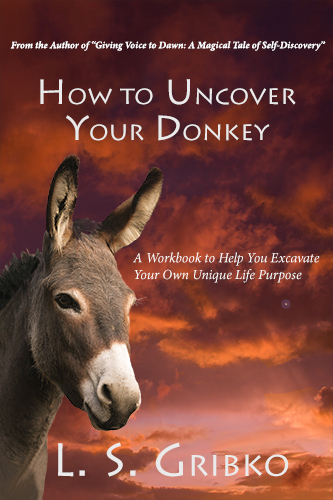 Corrections are welcome! 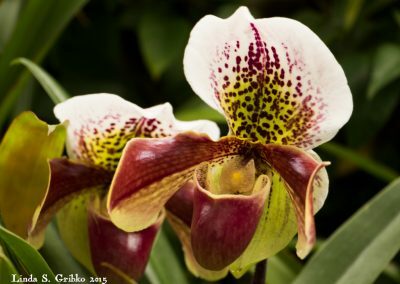 Two different 7-card assortments of Glasshouse Orchid Note Cards are available in the shop for only $10 each. 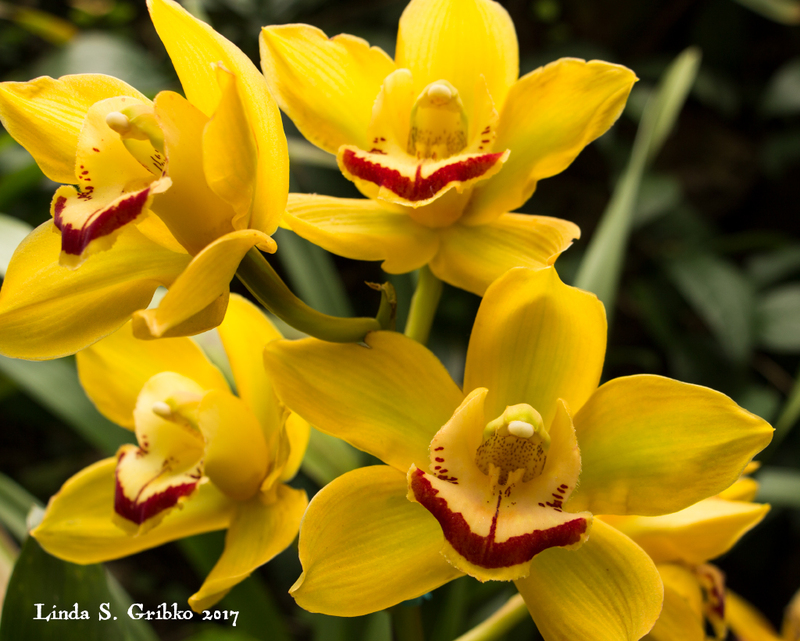 I’m pretty sure this is a Cymbidium orchid growing in the Orchid Room during the 2015 Spring Flower Show. Shot March 24, 2015. 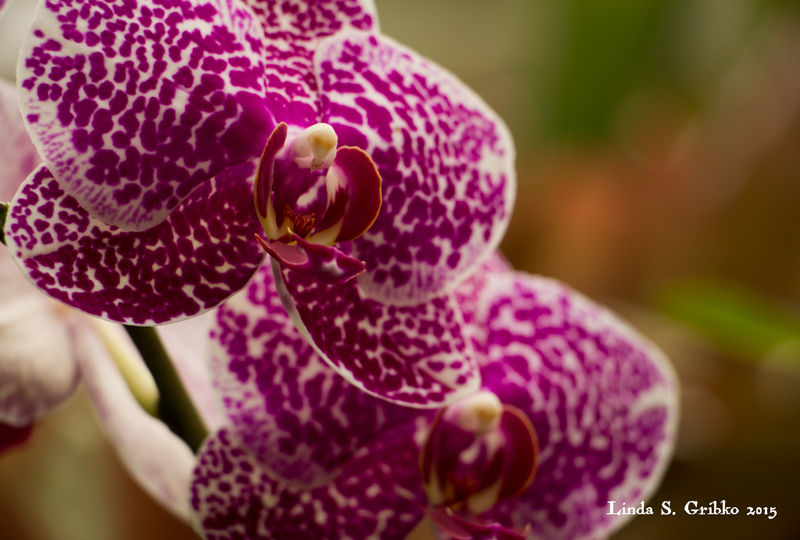 A beautifully speckled Phalaenopsis, or moth orchid, displayed in the Orchid Room during the 2015 Spring Flower Show. 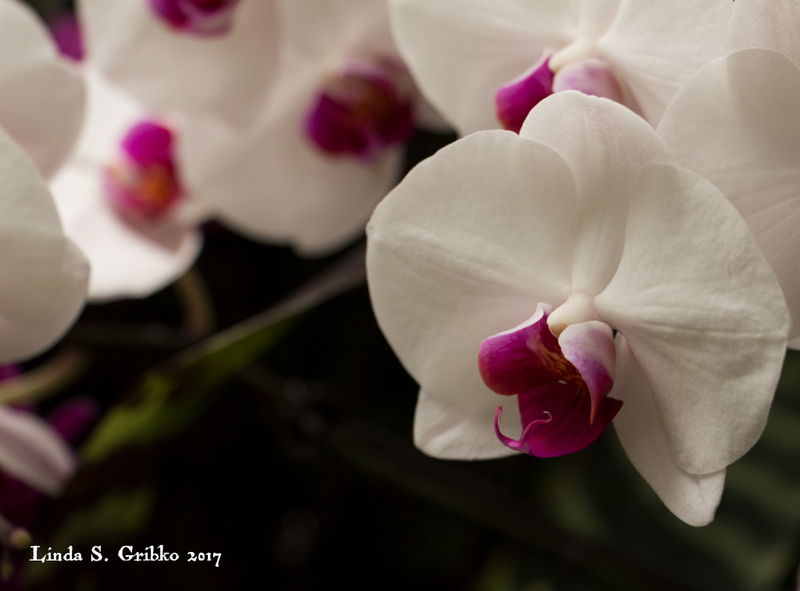 Shot March 24, 2015. 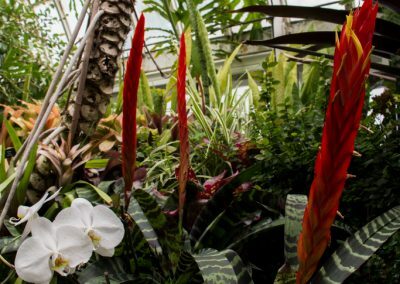 This amazing combination of white moth orchids and red bromeliads was on display in the Orchid Room during the 2016 Summer Flower Show. Shot July 22, 2016. This gorgeous Paphiopedilum is part of Phipps renowned Barbara Tisherman Slipper Orchid Collection. 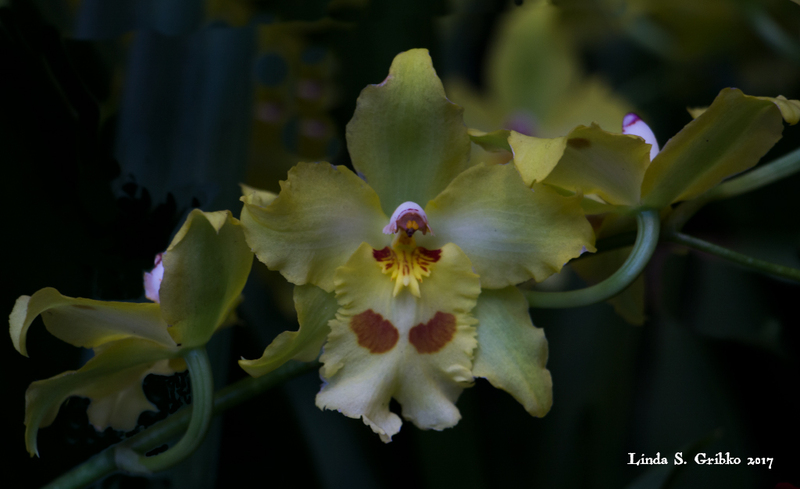 It was displayed in the Orchid Room during the 2015 Summer Flower Show. Shot May 13, 2015. 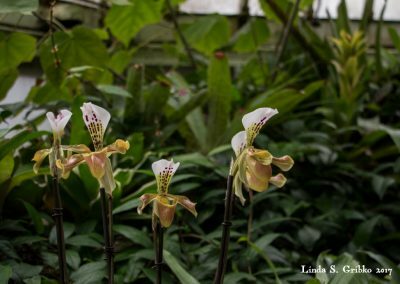 A quartet of Paphiopedilums, or slipper orchids, in the Orchid Room during the 2017 Orchid and Bonsai Show. Shot January 31, 2017. 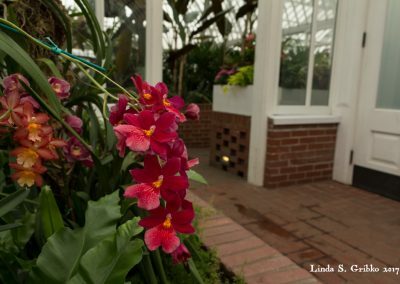 This red Oncidium hybrid trailed over its container at the far end of the Sunken Garden during the 2017 Orchid and Tropical Bonsai Show. 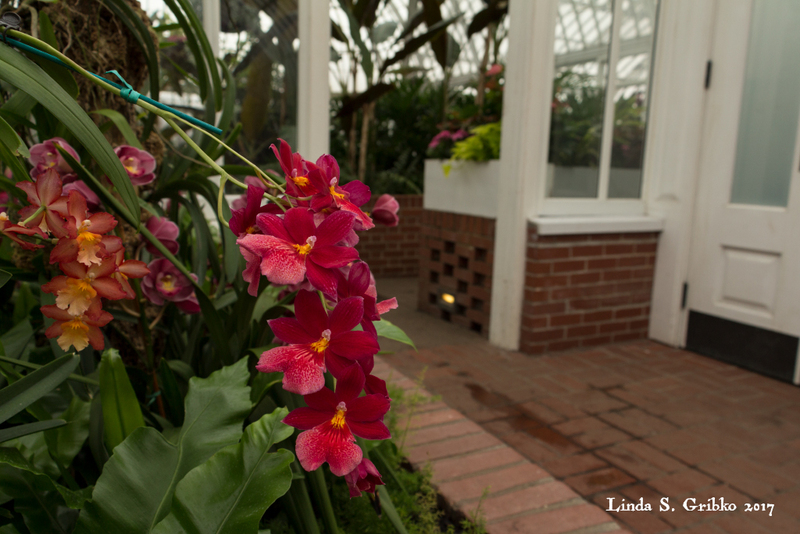 The Victoria Room is right there through the doorway. 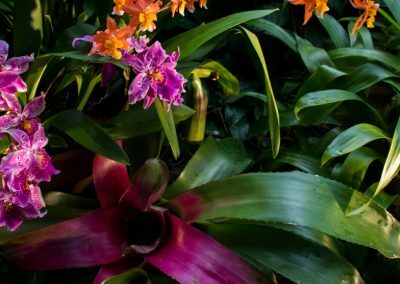 Shot on January 31, 2017. 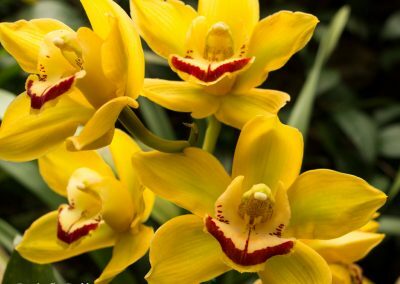 Gorgeous golden Cymbidium orchids on display in the Orchid Room during the 2017 Orchid and Bonsai Show. Shot January 31, 2017. 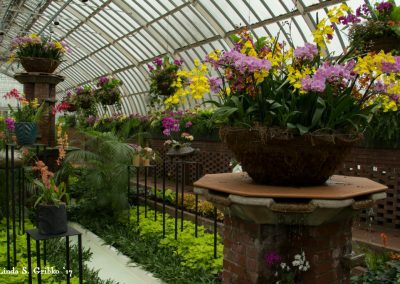 Cattleya orchids displayed in the Orchid Room during the 2017 Orchid and Bonsai Show. Shot January 31, 2017. 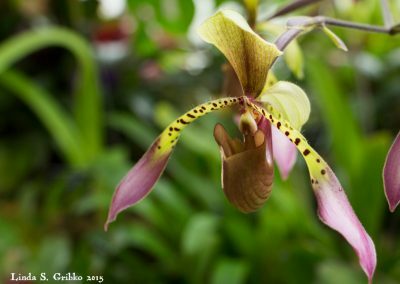 These are Miltassia orchids, a cross between Miltonia and Brassia types. 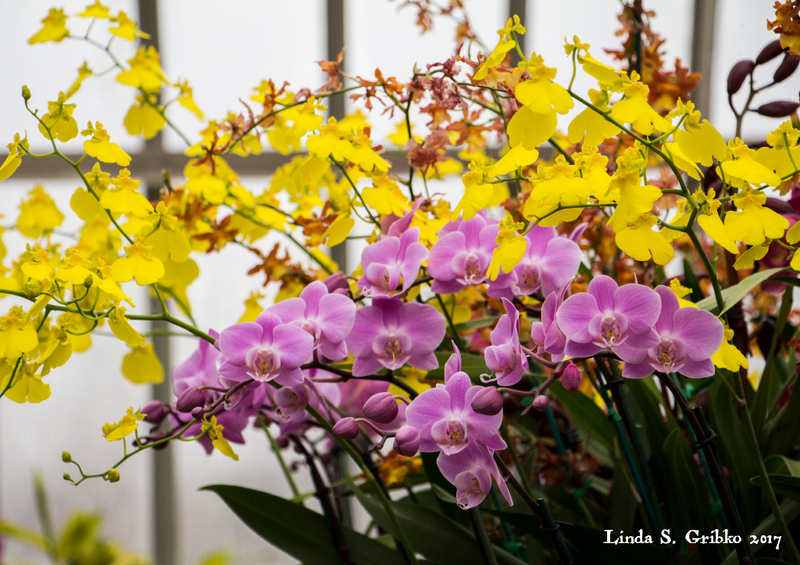 They were on display in the Orchid Room during the 2015 Fall Flower Show. Shot November 13, 2015. 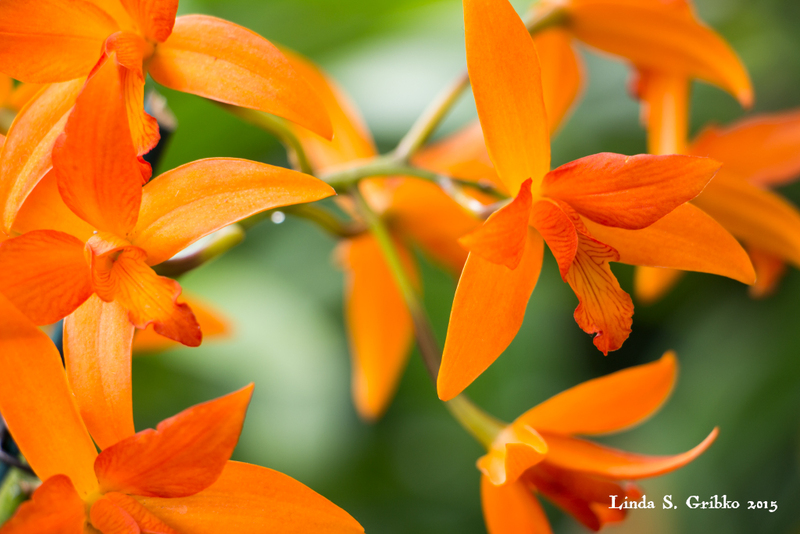 A bright spray of orange Laeliocattleya orchids found growing in the Orchid Room during the 2015 Spring Flower Show. This is a hybrid between the genera Laelia and Cattleya. 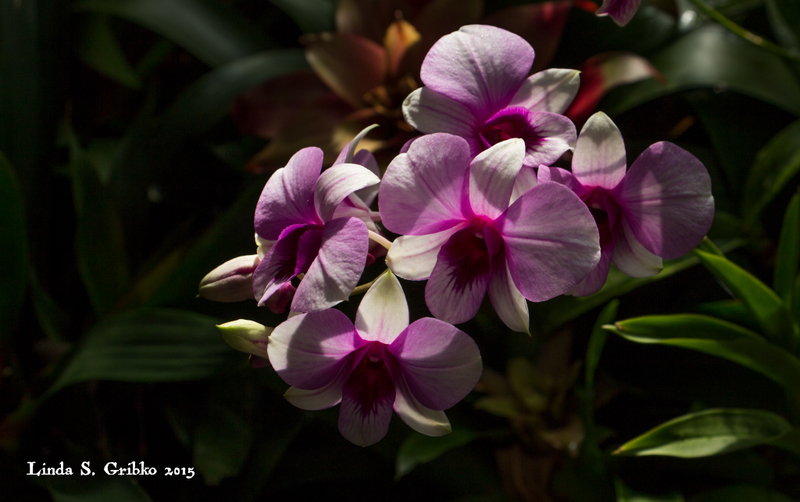 Shot March 24, 2015. 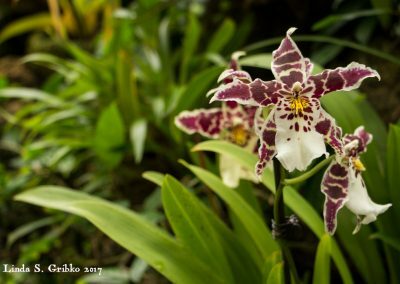 A maroon spotted Odontoglossum orchid. 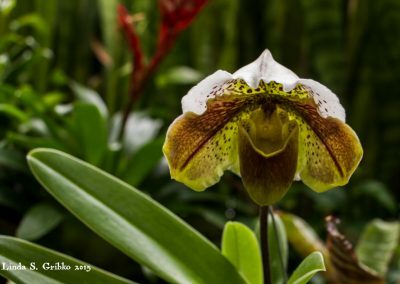 There are about 100 species in the genus and all have a pair of “teeth”. 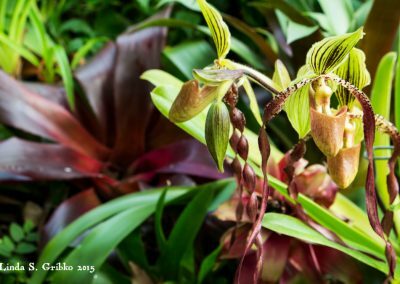 Shot January 31, 2017, in the Orchid Room. 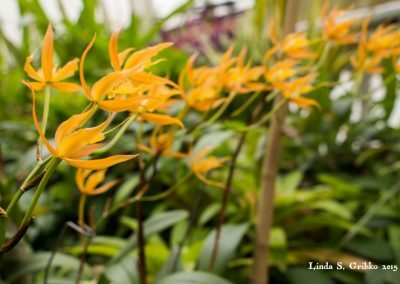 This beautiful combination of yellow and orange Oncidiums and pink Phalaenopsis was displayed in a huge basket perched atop one of the fountains in the Sunken Garden during the 2017 Orchid and Bonsai Show. Shot January 31, 2017. 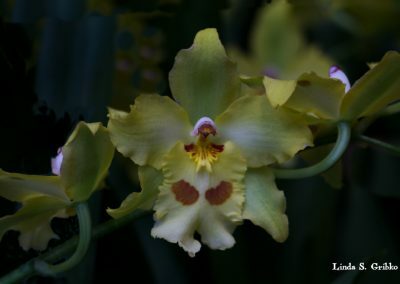 I think this is an Encyclia orchid, but it could be a hybrid or something else entirely. 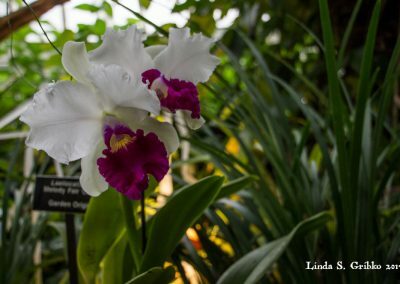 I found it growing in the Orchid Room during the 2016 Summer Flower Show. Shot July 22, 2016. 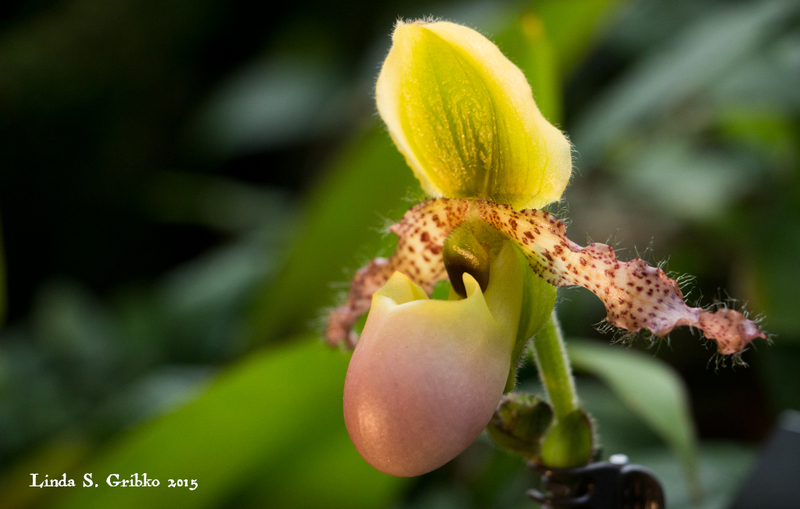 A petite yellow and pink Paphiopedilum, or slipper orchid, that doesn’t look quite real. 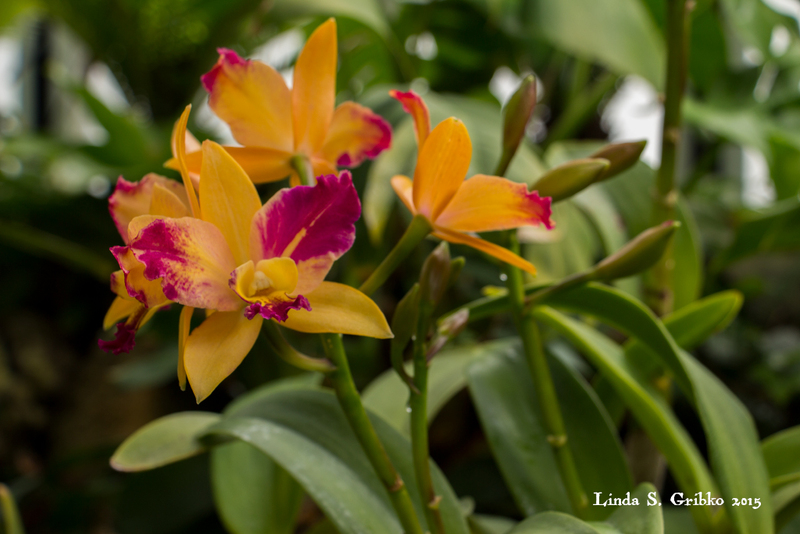 Shot May 13, 2015, in the Orchid Room during the 2015 Summer Flower Show. 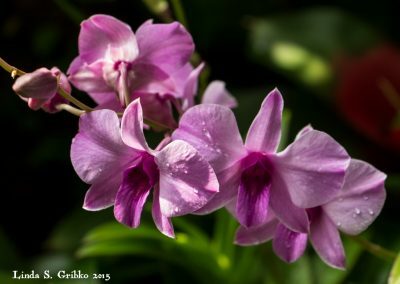 Strong light burning off the morning lit up this spray of pink and white Dendrobium blooms. Shot July 25, 2015. 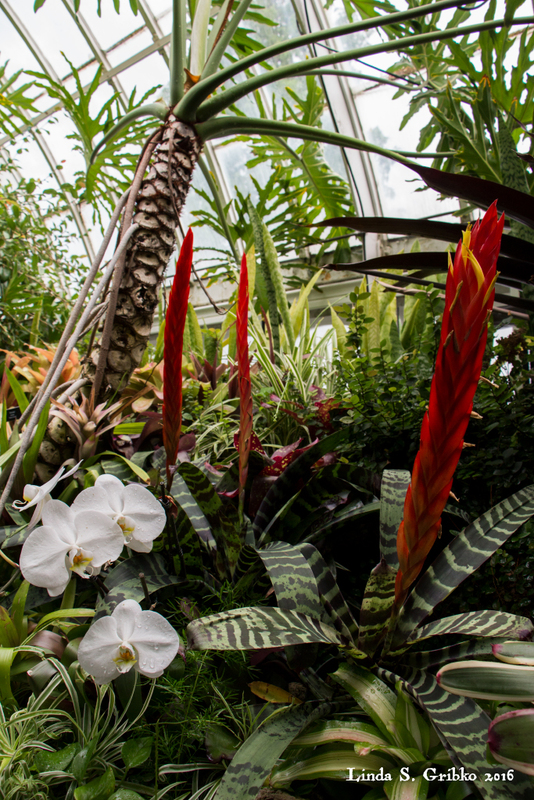 Isn’t the Orchid Room stunning? 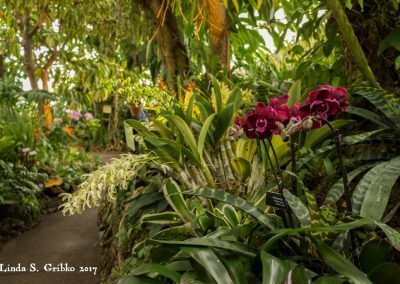 The gift along this curve in the path is a combination of red Phalaenopsis and cascading white Dendrobium speciosum. Shot January 31, 2017. 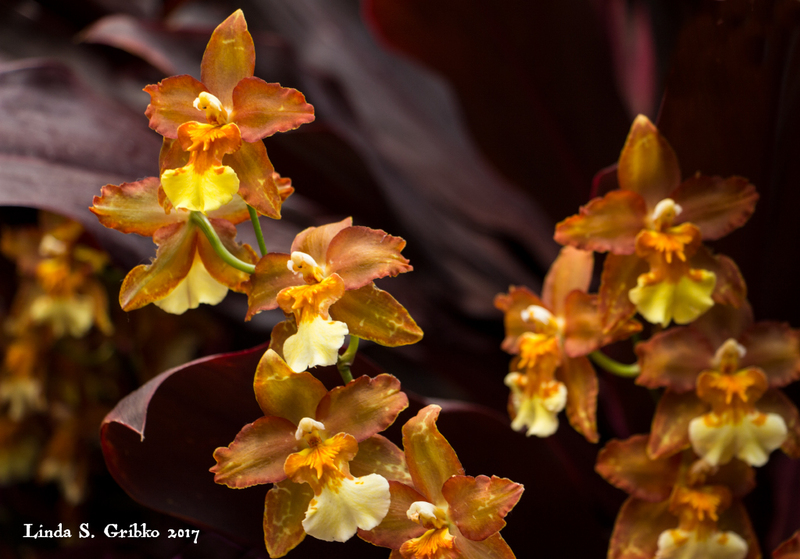 A spray of orange Oncidium orchids in the Orchid Room. 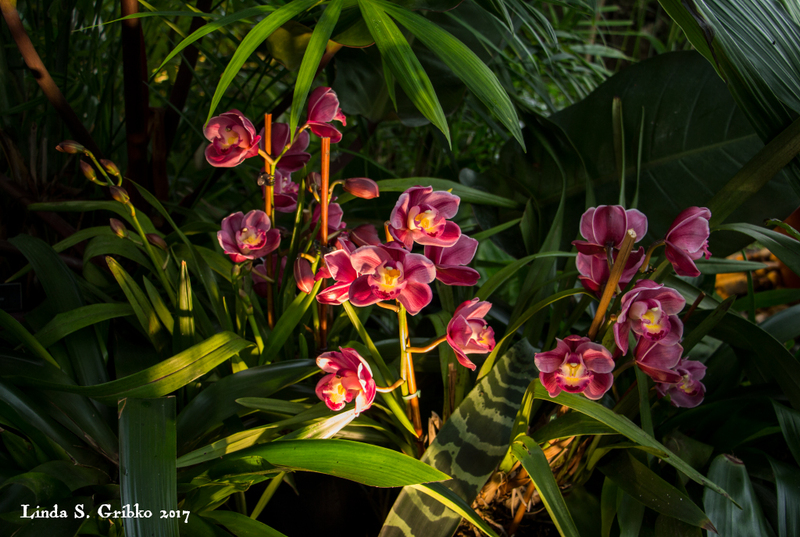 Shot January 31, 2017, during the 2017 Orchid and Tropical Bonsai Show. A pure white Phalaenopsis bloom with a bright magenta center. Shot January 31, 2017. 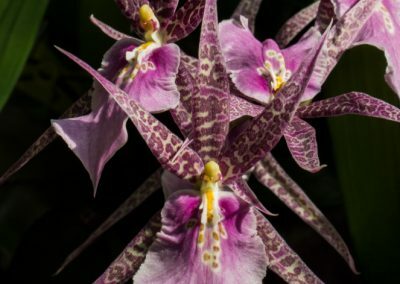 This is not an orchid. 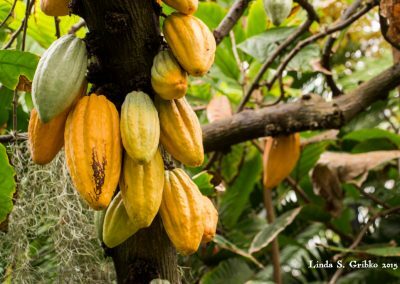 It’s a chocolate tree. 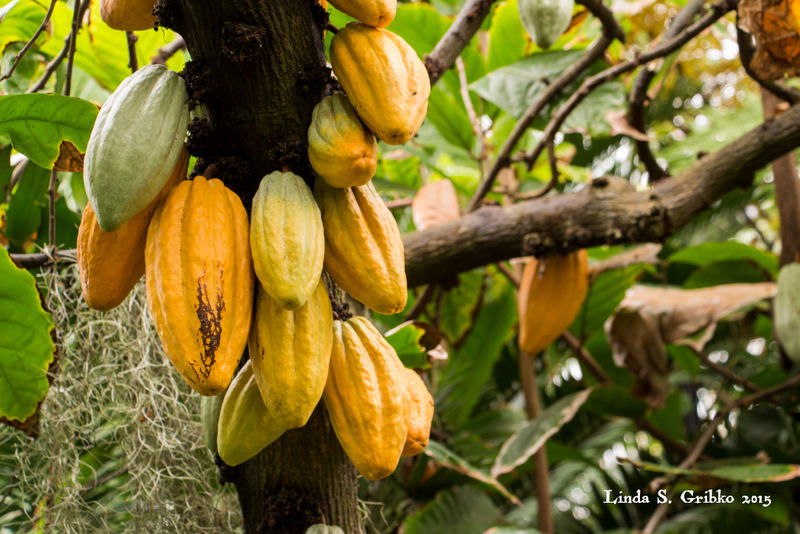 Because…chocolate. 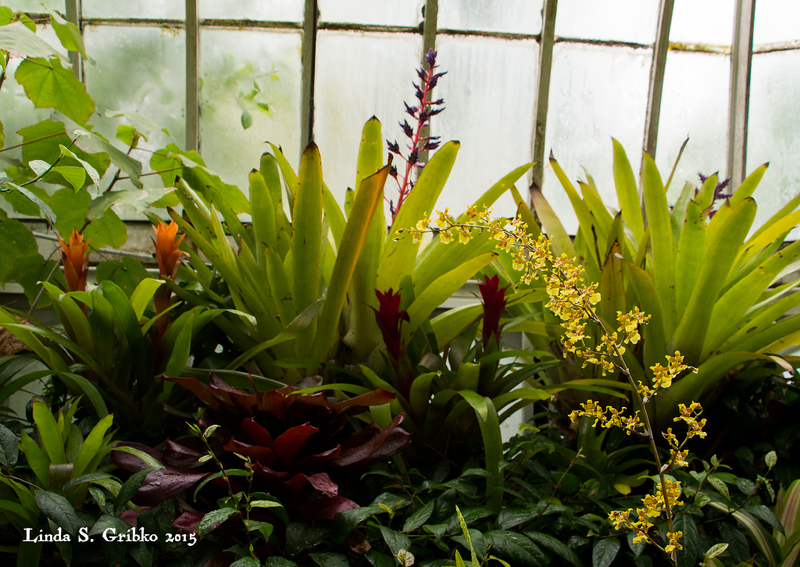 Shot March 24, 2015, in the Fern Room. 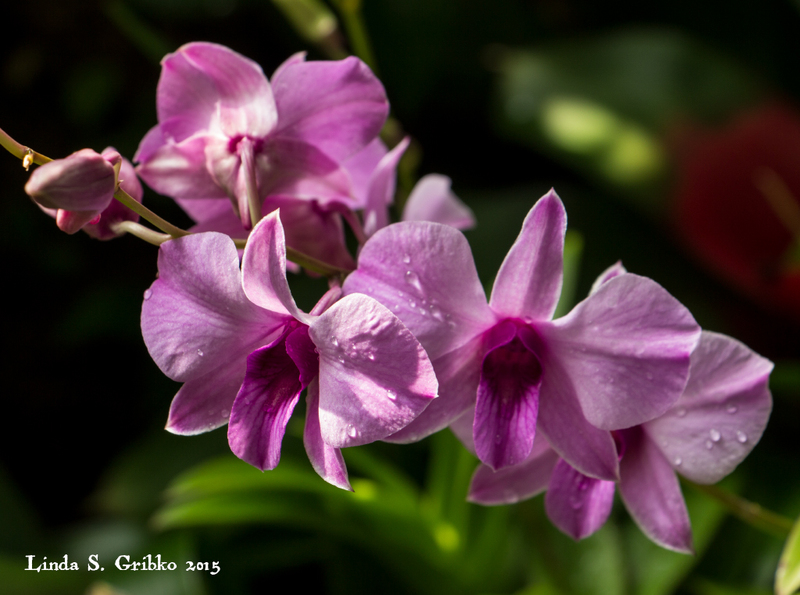 A spray of pink Dendrobium blooms displayed in the Orchid Room during the 2015 Summer Flower Show. Shot July 25, 2015. 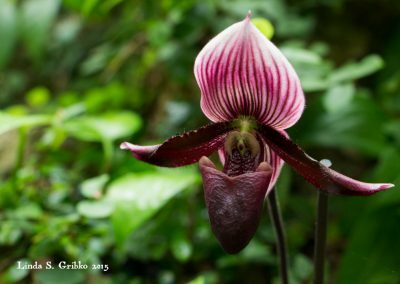 A wonderfully deep burgundy Paphiopedilum, or slipper orchid, with what looks like an upswept hairstyle. 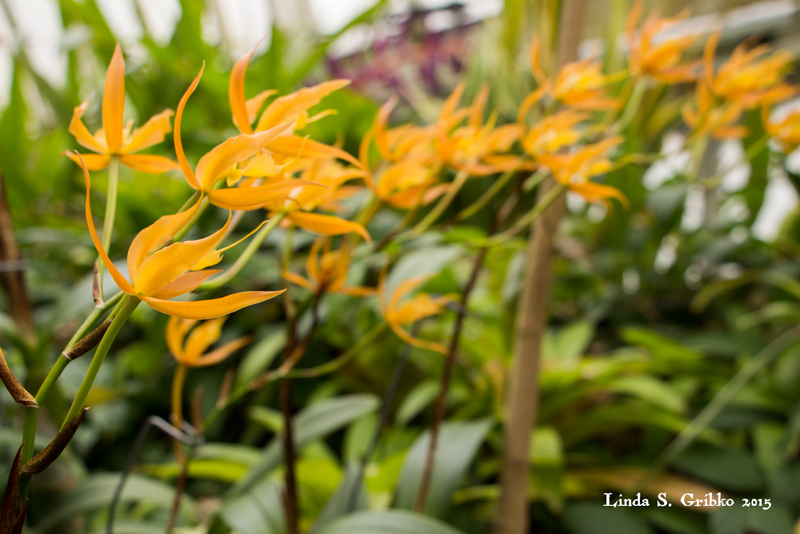 Displayed in the Orchid Room during the 2015 Summer Flower Show. Shot May 13, 2015. 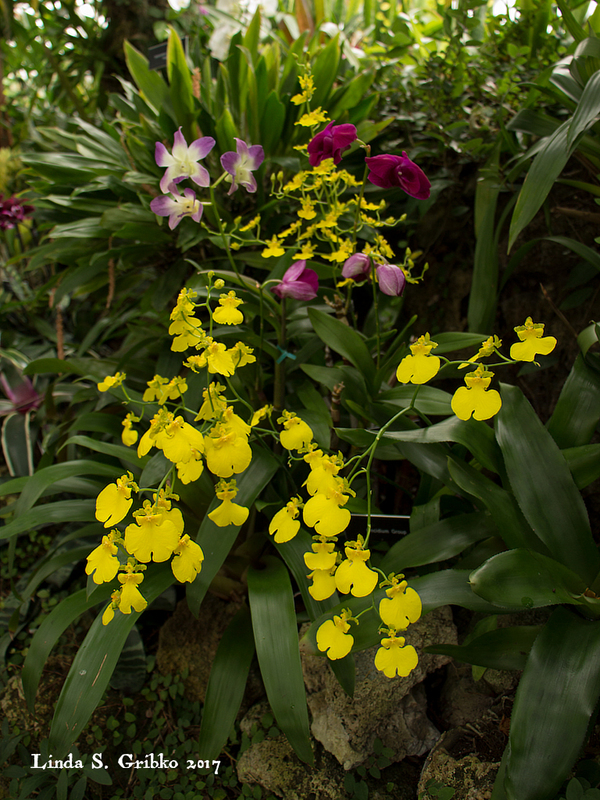 A spray of yellow Oncidium flowers arches in front of a softly focused glasshouse still life. Shot May 13, 2015. 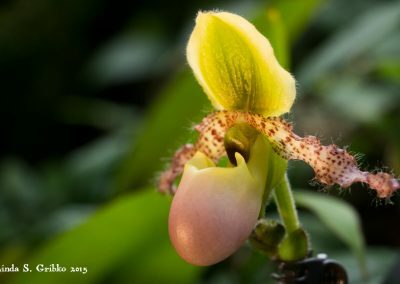 A limey olive and burgundy Paphiopedilum, or slipper orchid, with a protective white hood. 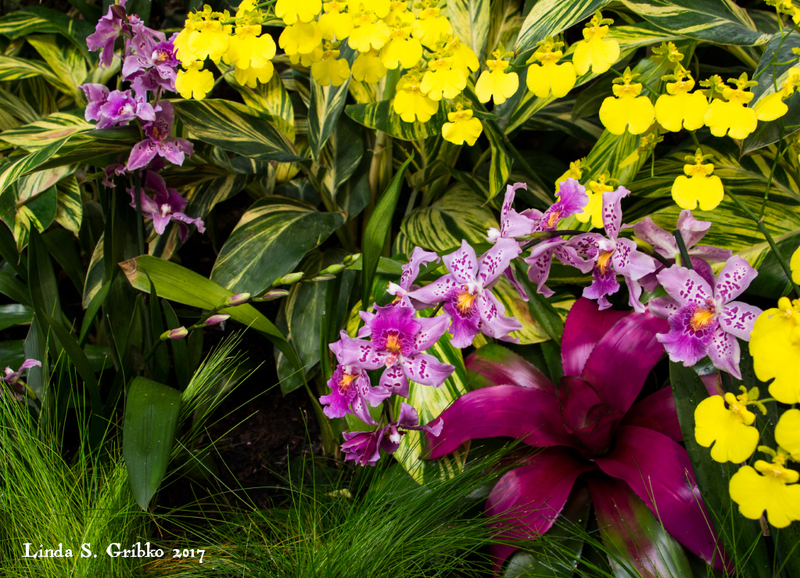 Shot May 13, 2015, during the 2015 Summer Flower Show. 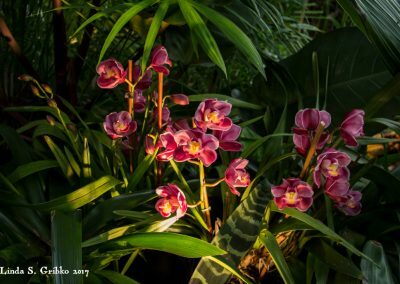 Beautiful deep pink Cymbidiums worthy of the spotlight in the Orchid Room during the 2017 Orchid and Bonsai Show. 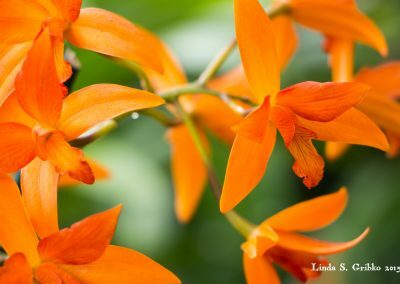 This have a mystical fragrance. Shot January 31, 2017. 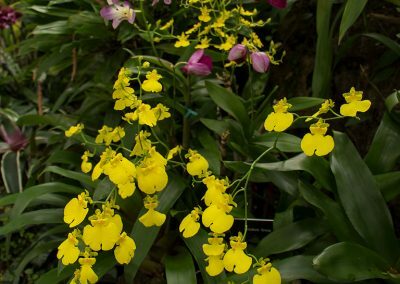 Sunny yellow Oncidium orchids with other varieties in pinks and white on display in the Orchid Room during the 2017 Orchid and Bonsai Show. Shot January 31, 2017. 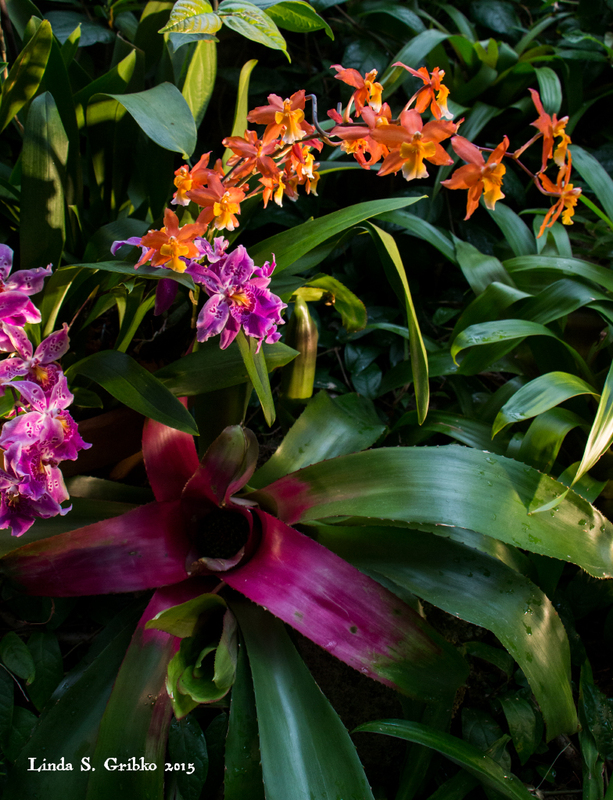 Pink and orange Oncidiums arching over a magenta blushed bromeliad in the Orchid Room during the 2015 Summer Flower Show. Shot May 13, 2015. 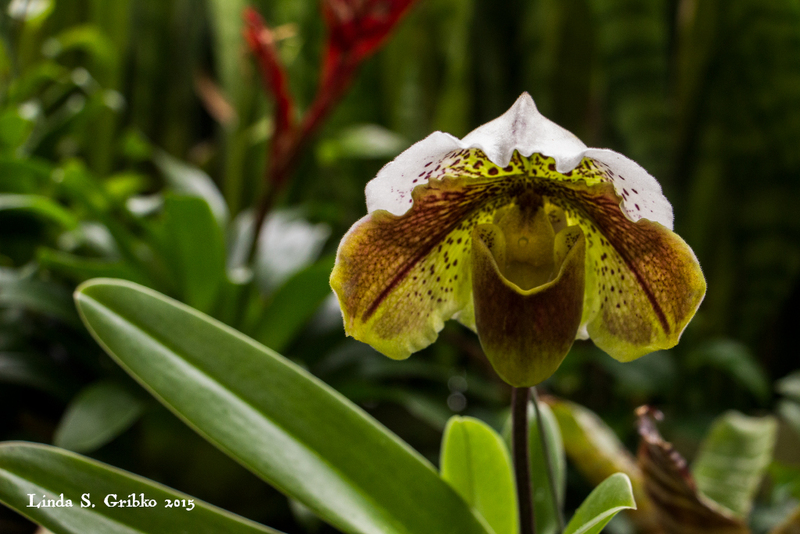 A graceful Paphiopedilum found blooming in the Orchid Room during the 2015 Summer Flower Show. Shot May 13, 2015. 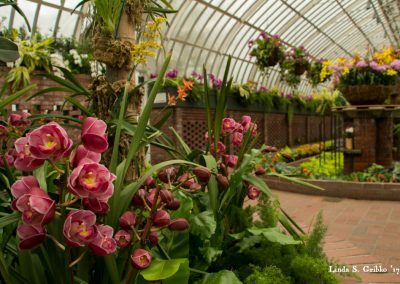 The Sunken Garden during the 2017 Orchid and Bonsai Show at Phipps. 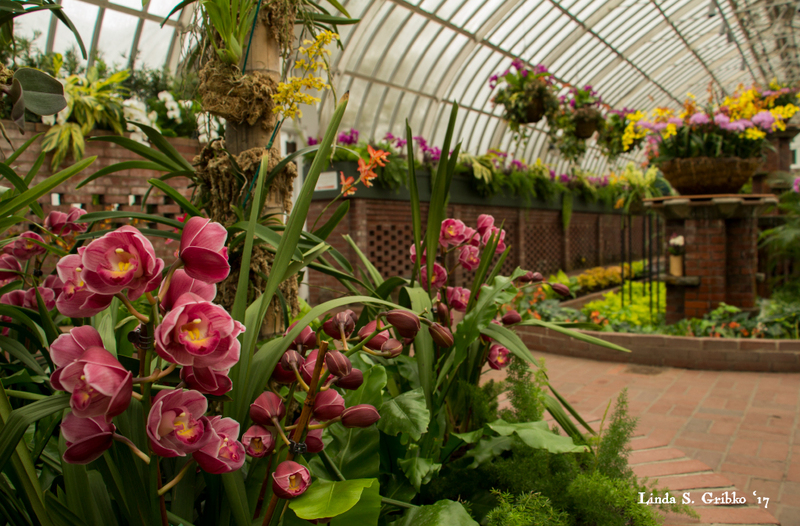 The orchids in the foreground are Cymbidiums. Shot January 31, 2017. 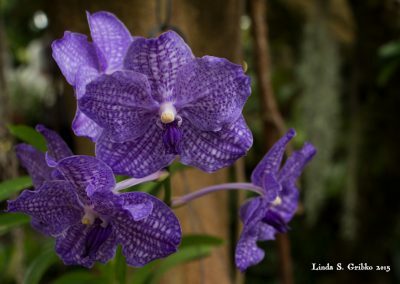 This was one of my favorites on display during the 2017 Orchid Show. 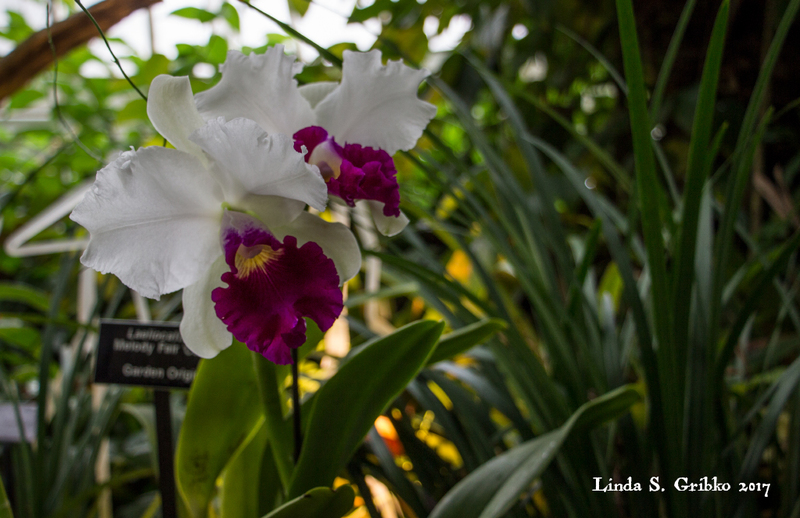 It’s a white Odontoglossum orchid with lavender pink picotee trim. 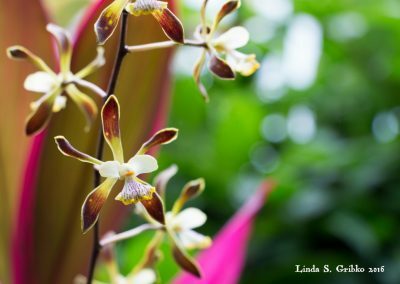 Shot January 31, 2017, in the Orchid Room. 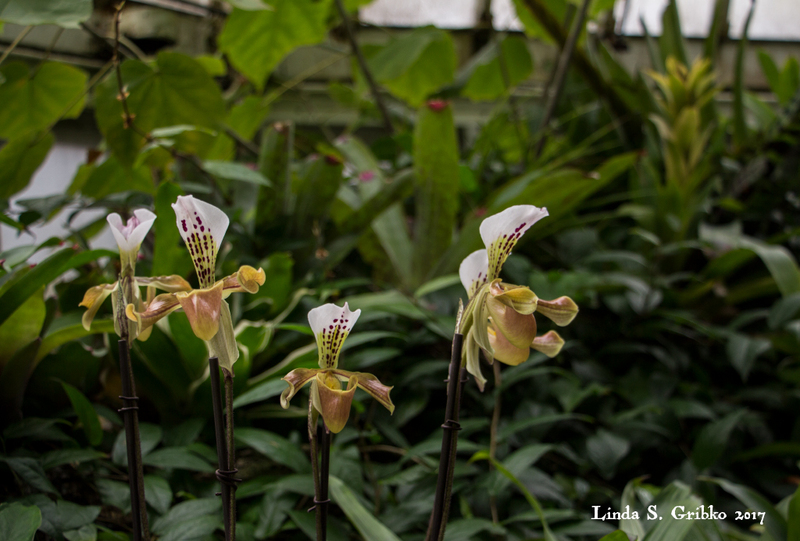 A sweet little grouping of Paphiopedilum, or slipper orchids, in the Orchid Room during the 2017 Orchid and Bonsai Show. Shot January 31, 2017. 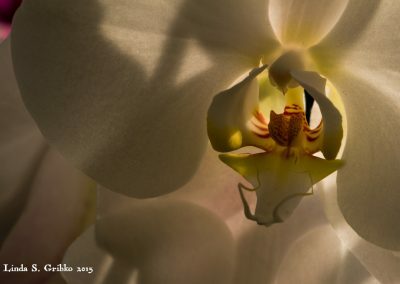 One of my favorite photos of the collection. 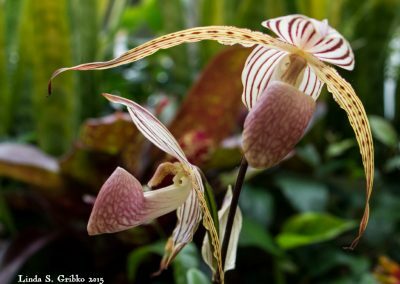 Paphiopedilum, or slipper orchids, as the focal point of a rich tropical still life. 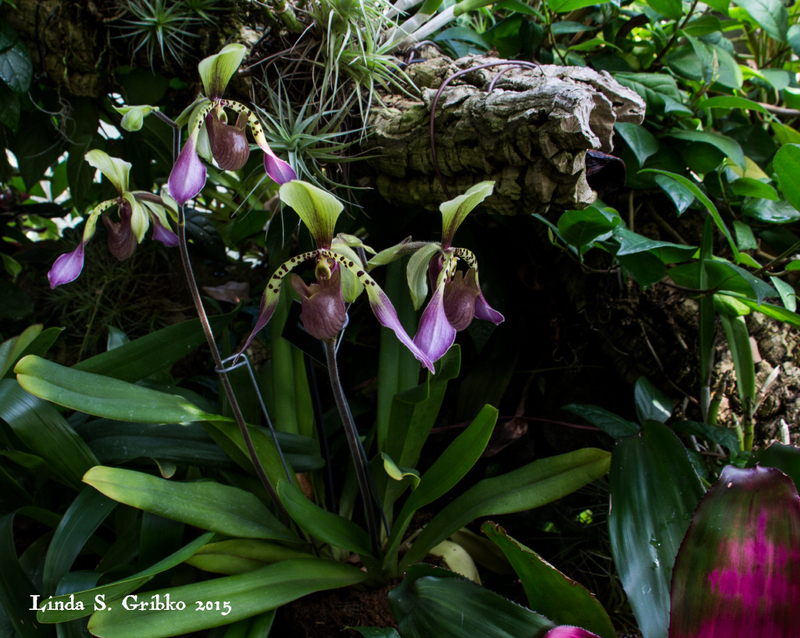 Shot July 25, 2015, in the Orchid Room. Sprays of dusky bronze Oncidium blooms against maroon foliage in the Palm Court during the 2017 Orchid and Bonsai Show. Shot January 31, 2017. One of the many gorgeous Paphiopedilums, or slipper orchids in Phipps’ collection. 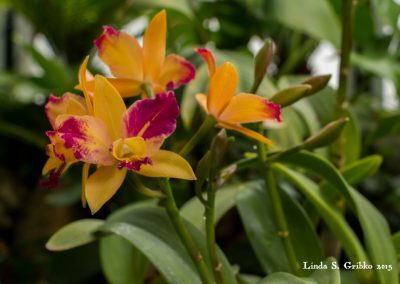 This one was displayed in the Orchid Room during the 2015 Spring Flower Show. 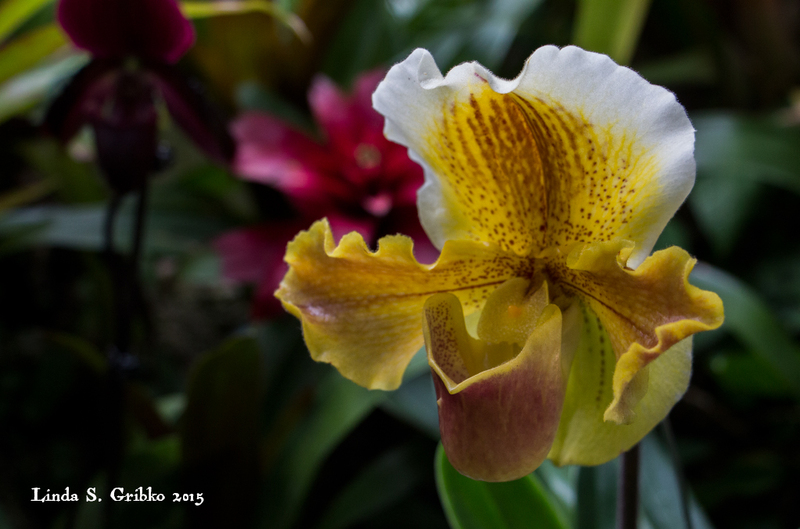 Shot March 24, 2015. 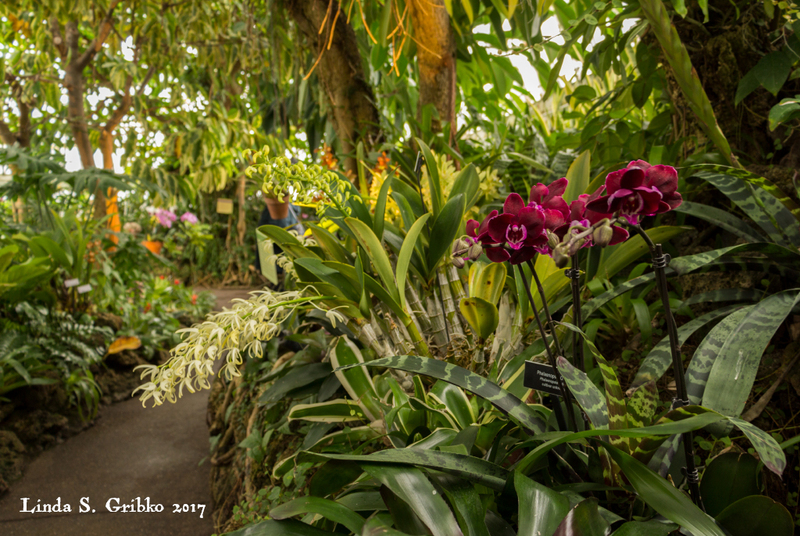 The Sunken Garden during the 2017 Orchid and Bonsai Show. Note the interesting collection of ceramic planters on tall pedestals. Shot January 31, 2017. 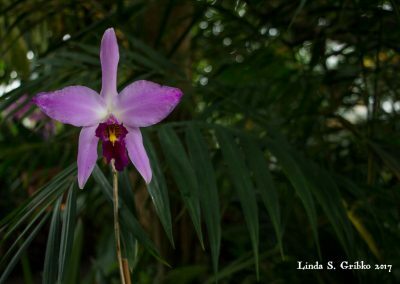 A pink Laelia orchid displayed in the Orchid Room during the 2017 Orchid and Bonsai Show. 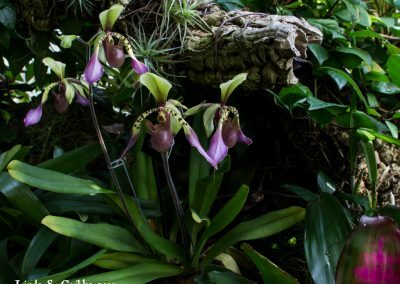 There are only 25 species in this genus. Shot January 31, 2017. 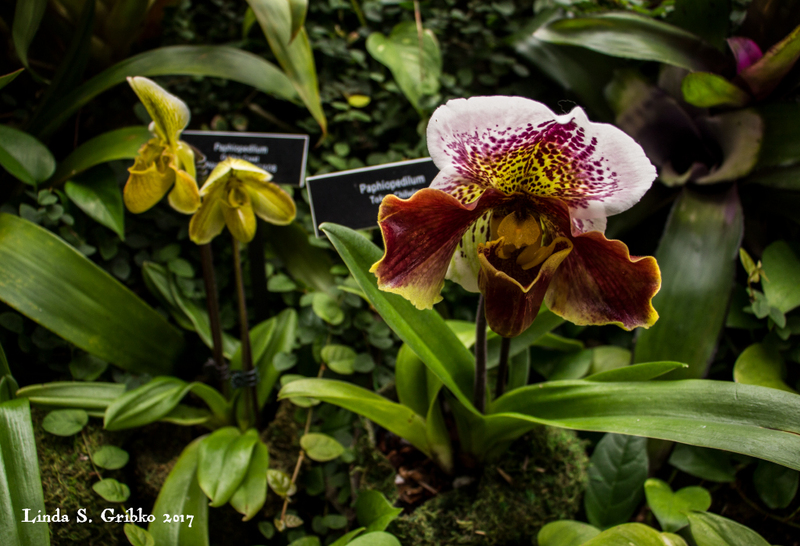 I think these are Phragmipedium orchids. They were displayed in the Orchid Room during the 2015 Summer Show. Shot July 25, 2015. 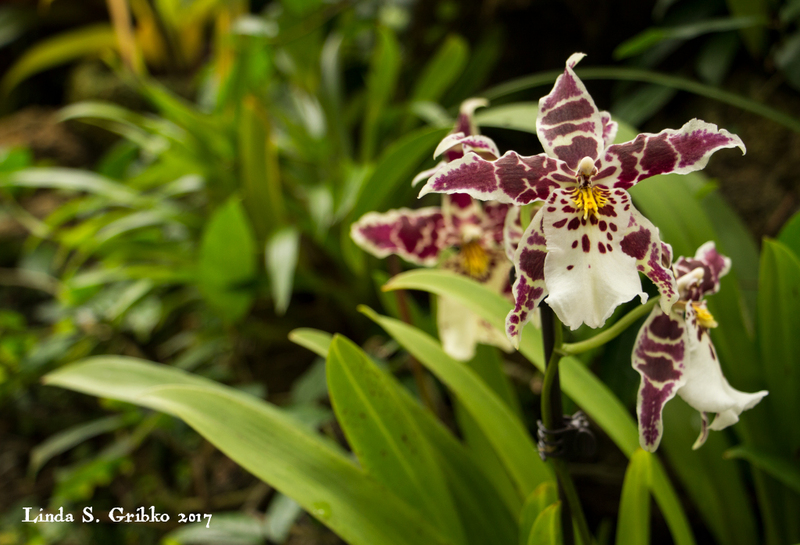 I’m pretty sure this is an Odontoglossum and I’m pretty sure it was on display in the Palm Court during the 2017 Orchid and Tropical Bonsai Show. Shot on January 31, 2017. 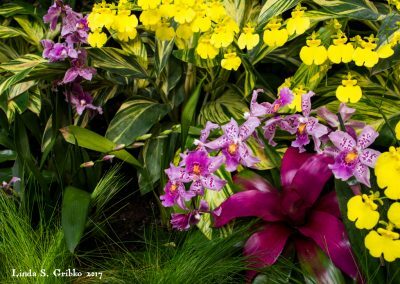 Sunny yellow and pink-spotted Oncidium orchids with bromeliads and fiber optic grass in the Palm Court during the 2017 Orchid and Tropical Bonsai Show. Shot January 31, 2017. 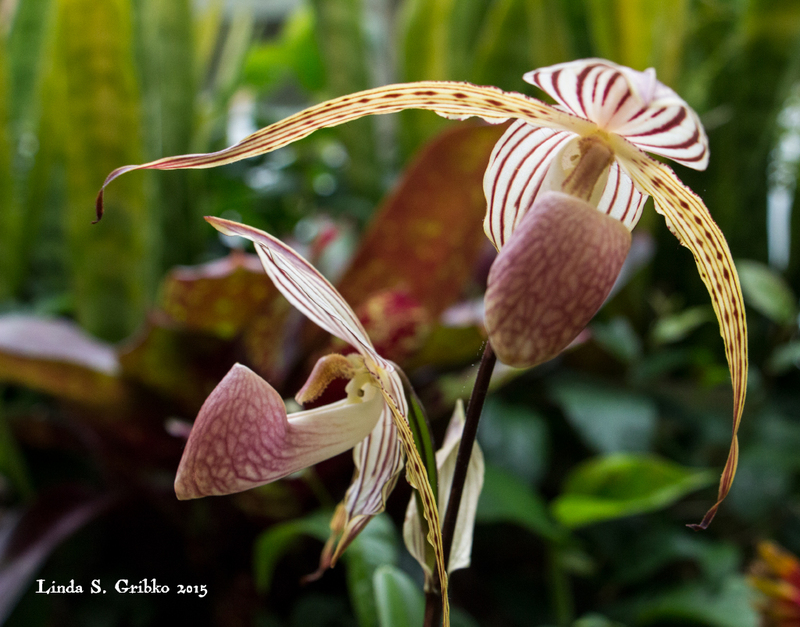 A pair of Paphiopedilum, or slipper orchid blooms, in the Orchid Room during the 2015 Summer Show. Shot May 13, 2015. 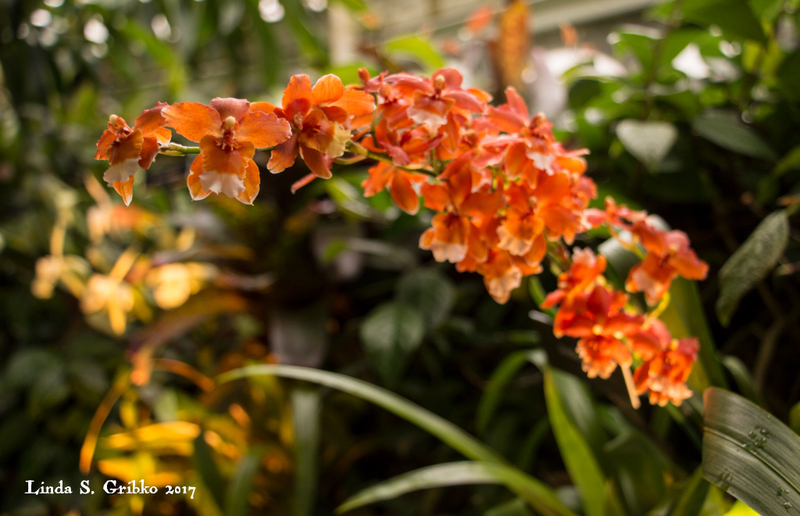 An orange Dendrobium speciosum discovered in the Orchid Room during the 2015 Spring Flower Show. 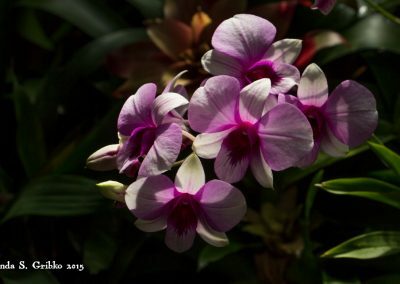 Shot March 24, 2015. 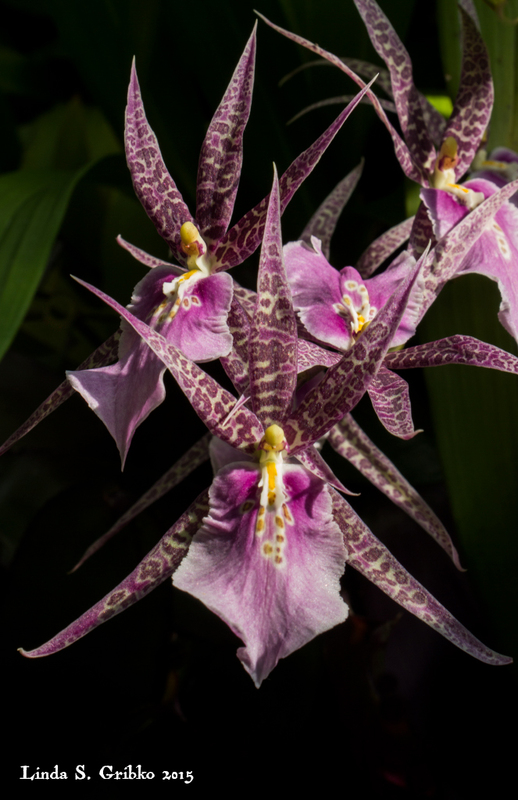 Stunning and unusual checkered Vanda orchid displayed in the Orchid Room during the 2015 Spring Show. 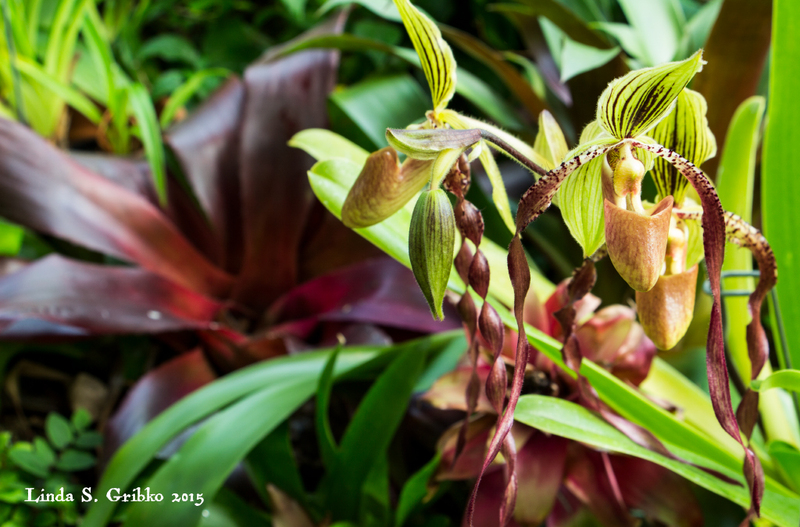 Shot March 24, 2015. 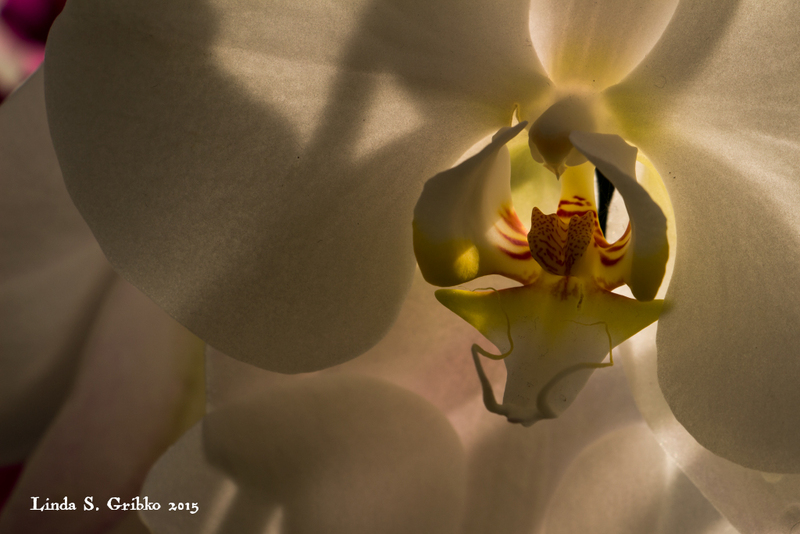 White moth orchid (Phalaenopsis) backlit by strong sun displayed in the Victoria Room during the 2015 Holiday Show. 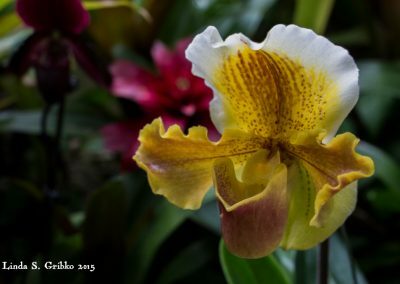 Shot December 16, 2015.